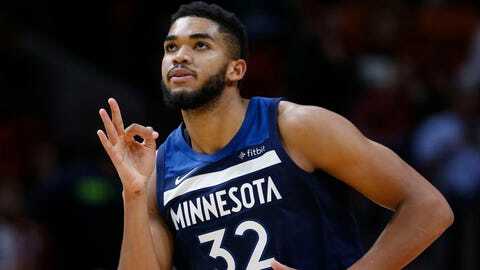 Minnesota Timberwolves center Karl-Anthony Towns finished with 20 points and 12 rebounds in an overtime win over the Miami Heat. The Minnesota Timberwolves sunk 11 of their 23 attempts from downtown during a 125-122 overtime win over the Miami Heat on Monday night. Jeff Teague and Karl-Anthony Towns led the way, knocking down three treys apiece en route to Minnesota’s fourth win of the season. Bjelica drops in a trey! Alley-oop to @KarlTowns! #Twolves tie it up!
. @KarlTowns will suit up no matter what.